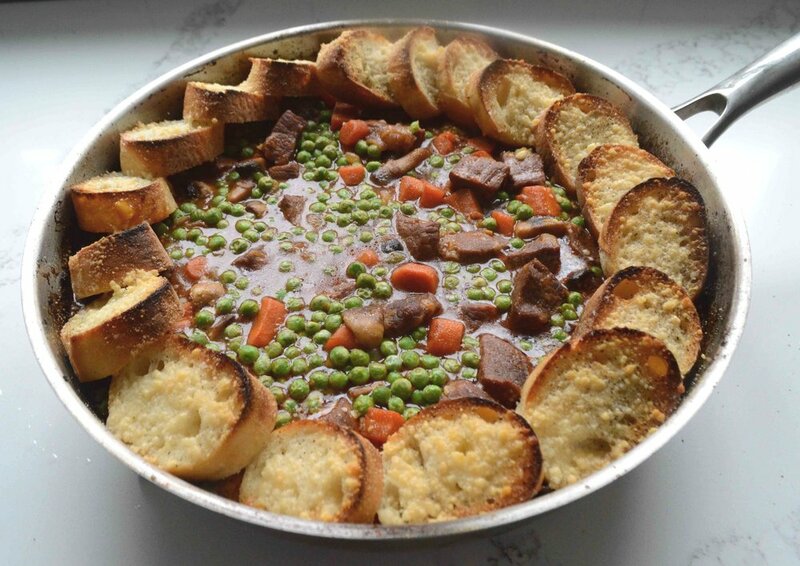 I am so not a fan of the cold weather but there are fringe benefits, like this delicious and warming Baguette-Topped Beef Stew. It’s the perfect antidote to chilly nights! In all honesty, stew has not always been my best buddy. I know it’s always talked about as a comfort food, but to me, it hasn’t been all that comforting, more of a bland and kind of goopy experience, with over cooked veggies and tough cubes of meat. So I was a little skeptical when I first saw this recipe but the shingled, crispy-looking baguette slices got the better of my curiosity and now YUM!! Stew and I are friends again! 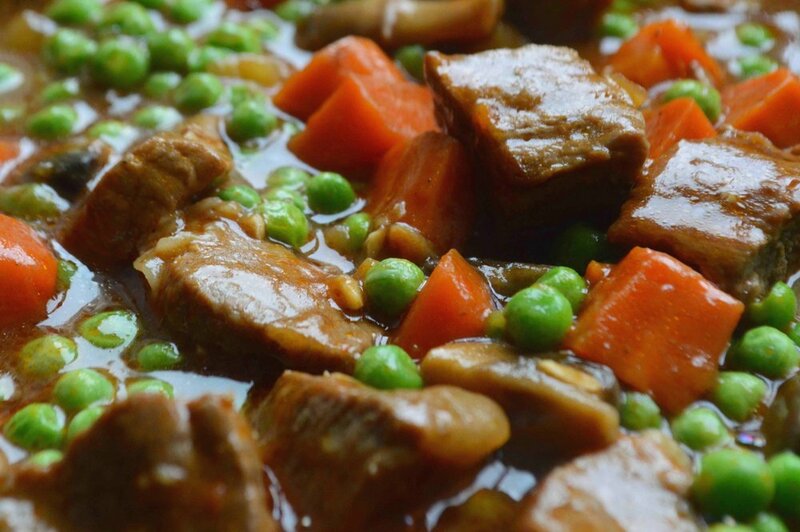 Tender fall-apart beef, just-right cooked carrots, peas and mushrooms and a rich and flavorful broth that goes a long way to soothe a cold and hungry soul, this stew is most definitely comforting but the Parmesan topped rounds of fresh baguette that get just the right amount of soggy while still maintaining the right amount of crunch, keep this dish miles away from ordinary. And then there’s the visual appeal—reminds me of the way dominoes fall if you line ‘em up just right. Definitely earned some oohs and aahs when it appeared on the table! Though I wouldn’t advise trying to whip this up on a busy night (it’s not difficult, but there are a few steps involved) the whole thing is made in one skillet, so the clean up is a breeze! So much to love! I’m officially back on the stew bandwagon and after one bite, you will be too! Stay warm! 1. Make sure oven rack is centered and preheat to 400 F. Pt beef cubes dry with paper towels and season with salt and pepper. Heat 1 tablespoon oil in a large, deep heavyweight, oven-proof skillet over medium-high heat. When oil is very hot, add beef and cook until well browned on all sides (you might have to do this in 2 batches depending on the size of your pan). Use a slotted spoon to transfer meat to a bowl. 2. Add carrots, mushrooms and onion to fat left in pan and cook over medium heat for about 6-7 minutes, until softened and lightly browned. Add in tomato paste and garlic and stir constantly for 1 minute. Then add in flour and stir for 1 minute. Pour in wine, stir and then let cook for a few minutes, until liquid is almost totally gone. Slowly stir in broth, scraping up any browned bits. Bring to a simmer, add the beef back in and stir well. Cover the pan and place in the oven. (If you don’t have a large, deep skillet with a lid that is oven-safe, you can transfer the mixture to large baking dish at this point and cover with a lid or aluminum foil.) Let cook about 1 hour until beef is completely tender, stirring halfway through the process. 3. Remove from oven and stir in the peas. Taste and season with salt and pepper. Raise the oven rack and preheat the broiler. 4. Use the remaining oil to brush one side of the bread slices and season with a dash of salt and pepper. Arrange the bread all along the edges of the pan in a circle, wedging them in if necessary. Sprinkle the Parmesan over the bread and place the whole thing under the broiler. WATCH CAREFULLY!! These go from golden brown to burned in a flash. Remove from oven and serve immediately. Note: Recipe adapted from One-Pan Wonders by Cooks Country. I tinkered with some ingredients and proportions.